My most used carry-on is the Vera Bradley 17″ Roll-Along Tote. I received this beautiful bag for my birthday last year and have used it many times with great success in the year and a half since. I find that it’s really nice to have a wheeled carry-on bag that fits under your seat. I fly on a lot of smaller sized regional jets, most of which make you gate check your standard size rolling bags due to small overhead bins. In all of my travels with this bag, there has only been one instance when it did not fit under the seat due to a metal box that just happened to be affixed to the underside of the seat in front of me. The bag is small at 17″tall x 14″ wide x 7½” deep yet surprisingly spacious considering how many built-in organizational components it features. The deep slip pocket in the front is a perfect place to store my lumbar support pillow. The back of the bag has a convertible slip pocket that turns into a “trolley sleeve,”allowing you to slip the bag over the handles of a larger suitcase. 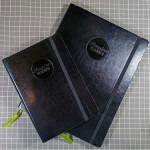 There is also a convenient pull-out identification tag area that is concealed for privacy. The inside of the bag is split into two zippered compartments. The more shallow one on top is where the checkpoint friendly quilted laptop sleeve is located (#1). This option makes it a breeze to pass through security at the airport without having to remove your laptop from the bag. I simply open up this top compartment and lay the bag flat to pass it through the x-ray machine. 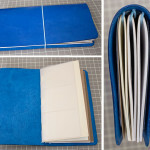 The other side of the top compartment has several narrow slip pockets for pens and small accessories. There is also a larger slip pocket with a snap closure that’s great for magazines (#2) and a zippered slip pocket perfect for stowing important documents. The main compartment of the bag is the deepest and can easily accommodate a small amount of clothes or, in my case, a large amount of equipment and in-flight essentials (#3). The top of the main compartment has two zippered pockets, including a shallow mesh one, which is great for snacks, and a more pouchy one below (#4). There’s also another built-in identification tag area. Another thing I love about this bag is the telescoping handle. It is the perfect length! It’s adjustable to choose the comfortable length for you. The bag also comes with a slip cover (not shown) for dust-free storage, a luggage lock, and a TSA approved quart-size clear pouch, perfect for storing your liquids and gels without the need for a quart-size ziplock bag. I always carry one in my luggage, just in case, but I’ve never had an issue going through security with this pouch. 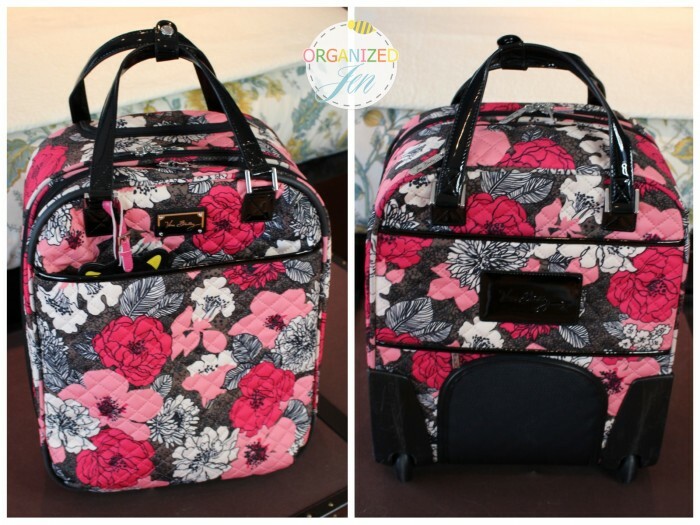 The Vera Bradley Roll-Along Tote is the bag I reach for on most trips, because I can fit all of my in-flight essentials and valuables in it. I can store it easily at my feet and it rolls which makes it easy to travel with. 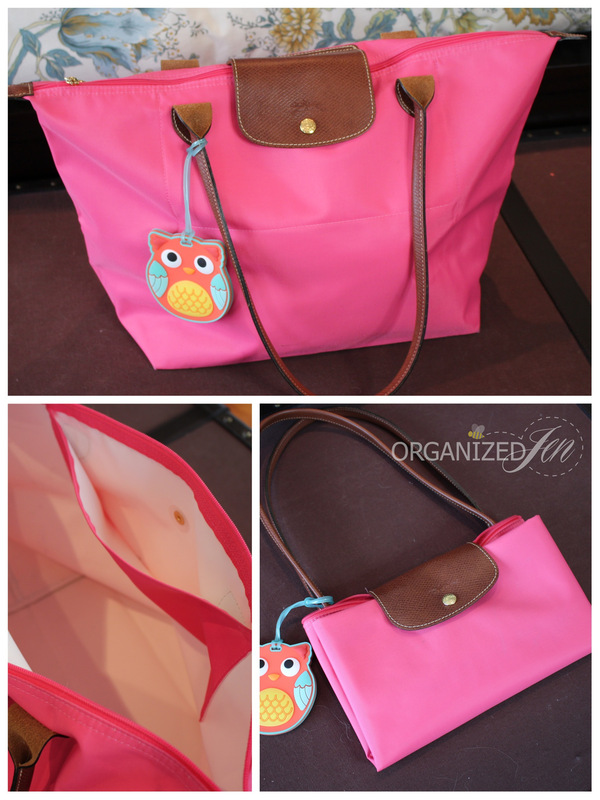 The next bag I am going to share is the Longchamp Le Pliage Large Tote. 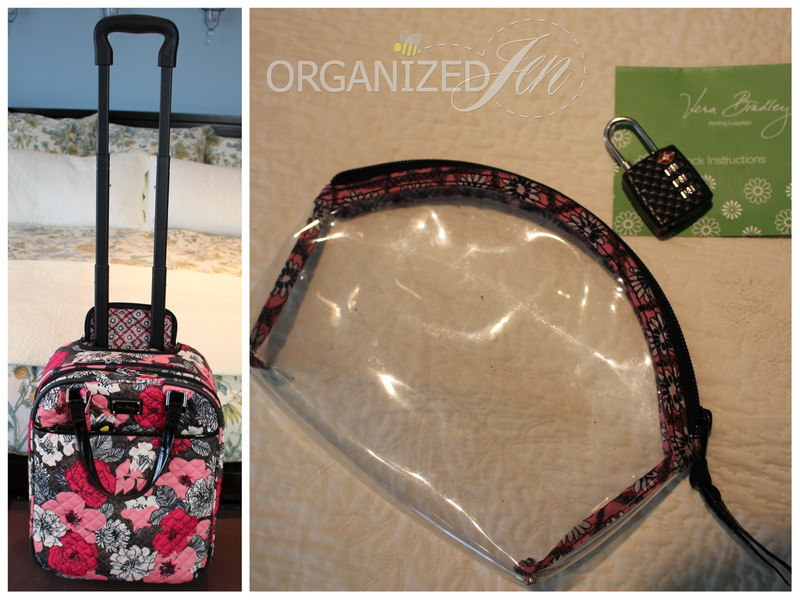 This bag is quite the opposite from my Vera Bradley Roll-Along Tote! I love the versatility of Le Pliage’s simple yet elegant design. The bag is constructed of high quality nylon for the body with leather straps. Not only is it roomy at 12 1/4″ wide x 11 3/4″ high x 7 1/2″deep, but it is light and folds up flat, which is great for packing. I always bring my Le Pliage with me as a pool or beach bag when we’re traveling to warmer climates. It’s great to pack into your checked luggage as it takes up neither precious room nor weight. It also functions as a wonderful carry-on option when I am traveling light. For me, “traveling light” means no computer and less cameras than usual. I find that the 9″ drop shoulder handle is the perfect length for comfort. There are no bells and whistles with this bag other than a simple slip pocked on the top interior, so packing with my own pouches and cases is a must for organized travel. The last bag I am going to share is also my newest and one I have very little experience with so far. I recently purchased the Case Logic SLR Camera/Laptop Backpack specifically for traveling with my expanding camera equipment. I made the switch earlier this year to filming the majority of my videos (aside from vlogs) on my DSLR camera, a Canon Rebel T4i. Since then I have slowly acquired more lenses and related equipment. These expensive and delicate items require specific packing facilitators. 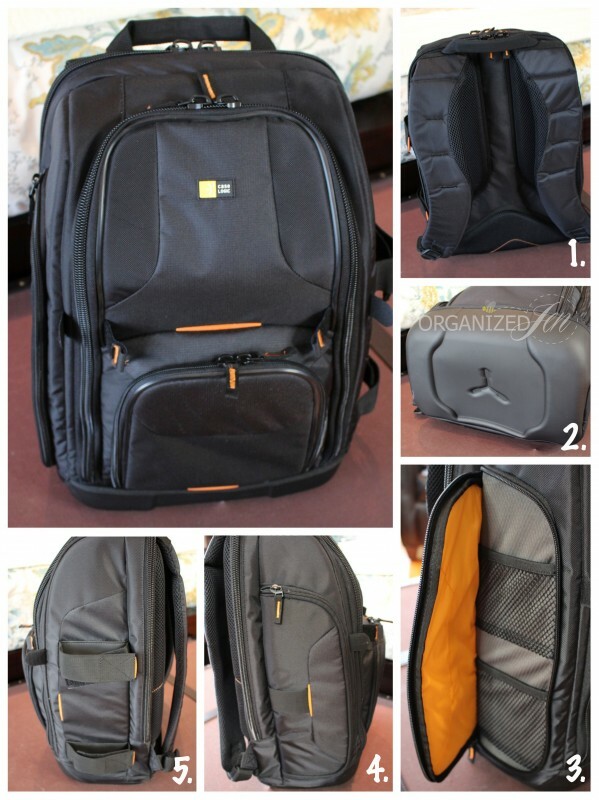 I like the idea of a backpack that can not only hold all of my camera equipment I might travel with when I know I will be filming special videos or taking a lot of pictures for my blog, but it can also accommodate my laptop and in-flight essentials. The bag measure 17″ tall x 8″ deep x 12.5″ wide, weighs 2.7 lb, and is made out of a tough nylon material. 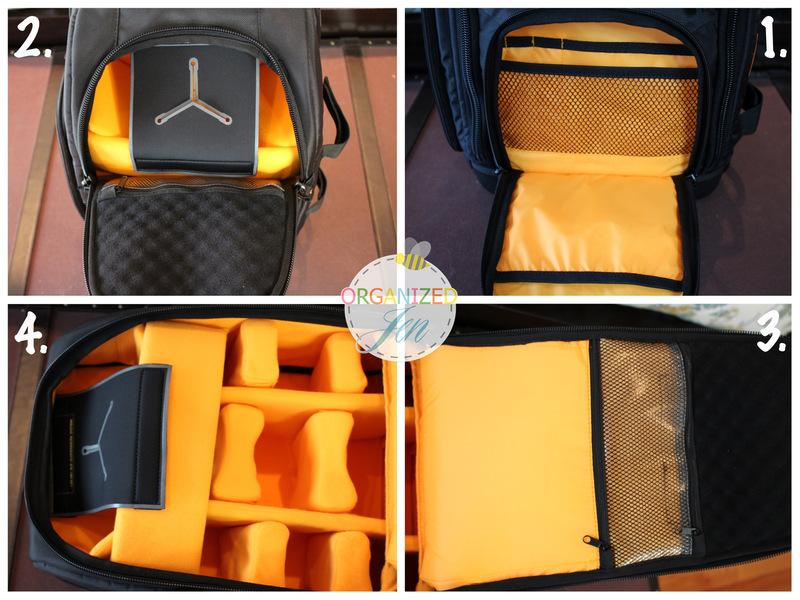 The back of the bag features an airflow design with lots of padding for comfort (#1). The bottom of the bag is constructed out of a water-resistant EVA base that protects the bag when you set it down (#2). It also functions to stand the bag upright on its own. I love how every available area on the exterior of this bag is dedicated to stream-lined storage. There is a nicely padded and roomy zipped laptop compartment (not shown) that easily fits my 15″ Macbook Pro as well as a few magazines and my travel folder. One side of the bag includes heavy duty velcro straps to secure a travel size tripod (#5). On the other side there is an easy to access zippered compartment (#4) that covers two mesh pockets, which I use to keep my phone and vlogging camera at the ready for easy access and safe storage (#3). There is also a surprisingly roomy front pocket on the exterior of the bag with slip pockets for small accessories (#1 below). The inside of the bag is where the design is more specifically dedicated to camera equipment storage. There is a cool hammock suspension feature when you zip open the top of the main compartment that houses your DSLR (or SLR) with the lens pointing down for easy and quick access (#2). This is a great feature if you plan to use this bag for shoots, rather than specifically for travel (although it works great just for storage during travel as well!). Memory foam padding helps to protect the back of your camera when stowed. The inside of the main compartment’s zip flap also has two zip pockets, including a water resistant mesh pouch (perfect for memory cards and extra batteries) and a nicely padded option that I tucked my external hard drives into (#3). I love how every part of the main compartment is adjustable and removable thanks to velcro components and plush padding (#4). 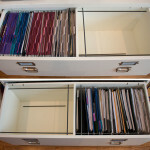 You can use the included “shelves” in whichever arrangement suits your needs best. I was easily able to store my camera, two additional lenses and all of my electronic cables and chargers, as well as my Travel Walking Pharmacy, Kindle, Bose headphones, scarf, and slipper socks into the main compartment on my most recent flight using this bag. That’s not too shabby for a bag designed specifically for equipment! I plan on using this backpack when traveling with more than one camera lens for safe and organized travel. I’ve used it once since I filmed the video and it worked beautifully! Check back next week for an in-depth look at my current in-flight essentials! Happy Travels! My mocha rouge 17 inch rolling tote just arrived today!! so cute, and can’t wait to use it! I actually ordered it from the Vera Bradley outlet store (I went in and they took care of ordering it). I got it for $125 plus tax. really good deal for an organized carry on which was originally priced $220. Have you ever seen any of the bags from Lug? http://www.luglife.com I love their travel stuff, I use their travel wallet for all of my international trips because it holds everything I could ever need and then for a day bag I use the cable car satchel, it has so many compartments and like you I love to be organized so I thought that bag was so perfect for travel and its cross-body so i felt secure in places like Rome where there are so many pick-pockets to worry about. I use their Shuttle Bus Weekender as my carry-on and also as my luggage any time I go on a short trip like visiting my best friend or sister for the weekend. It also is pocket crazy and the material is so nice and they come in so many colors, I always like my luggage to match, I have the ocean blue color in everything its very pretty. I like to take my Le Pliage bag for travel as well when I am going somewhere that i don’t need to carry as much with me. TFS! I have a pillow from Lug Life that I always bring on the plane with me. I’ve never seen their bags before! We did go on a Caribbean cruise once about 7 years ago. It turns out I don’t really like being on a ship for more than a few hours. If I were to pack for a cruise now, I would probably pack in the same way I would for a land-based trip with the same climates. 1. How are you able to fit your computer inside the Case Logic SLR/Laptop Backpack? Is it hard on your back with all of that camera equipment and your computer in there? 2. I, recently, got an Instagram account and my cousin-in-law took a picture of me with my painted nails and I was wondering if you could take a look at it? I was inspired to paint my nails with that pattern after a cute dress that I received from a friend. It would me the world to me if you ever did!!!!!!!!!!!!! 3. For your OLJ Q&A videos and Tea & Talk with Jen videos, where is the best way for me to ask you questions for those videos? It was easy to fit my computer inside. The bag does get heavy with all of the equipment in it, but the design distributes the weight evenly. Love the VB roll along tote! I purchased one after seeing it in a couple of your Organized Like Jen travel videos. I took it on our trip to Disney World in May and loved it! It kept everything so organized and was so easy to carry and roll. The TSA friendly laptop compartment is great! For a longer flight I’d bring the usual and additionally be sure to have my Kindle filled up with books to read, a few more snacks, and maybe my iPad charged up & loaded with a few movies. Your summer place looks so lovely, enjoy your time!! PS: I am usually not a blog reader, I watch a lot of YouTube. However, I stopped commenting on videos in general because I feel comments get lost in all the other thousands of comments… So all I wanted to say is, I like your blog very much. Very pleasing to the eye. You put a lot of work and effort in it and it shows. I hope you don’t mind when I comment on content from your videos on your blog. Hi Jen, please share where you purchased your “zippered sand bags” that I believe you ordered for your tripod, did it work for you? I am going to Miami, Florida in mid October for 5 days. I was wondering if you think this bag would work when wheeling araound another bag a bot larger? I appreciate your help Jen. I’m only thirteen and you are one of my biggest inspirations in life along with Justin Bieber and Luke Hemmings! Lots of love and hugs to you Jen! I’ve definitely wheeled two bags successfully before but it can be a handful. I do have a Vera Bradley Roll-Along Tote, and I really love to carry it while traveling. I just ordered the Vera Bradley bag for $110 from the Vera Bradley site. All mocha rouge items are 50% off every Wednesday. Can’t wait to get it! Oh oh oh….it just arrived today…love love LOVE IT…I went back to the Vera Bradley site to see what else is on sale and noticed that the 17″ Rolling Tote is GONE in Mocha Rouge – they only have Boysenberry left, and it’s $125 – $15 more than what I paid. (But still a great price). I then looked in the luggage section to see if it might be there, but they don’t have the Rolling Tote listed in the luggage section at all. I think it is being discontinued. If anyone is thinking about getting this, like I did for a long time, stop thinking and get it now. Boysenberry is pretty too. Jen, which do you think holds more – the liquids bag that comes with the rolling tote, or the new 3-1-1 bag? The one that comes with the rolling tote seems kind of small. Sorry I take that back – the Boysenberry is on sale for $165. So glad I bought this when I did. Thanks for the head’s up about the rolling tote! I think the 3-1-1 holds more but I haven’t done any real testing to see if it does. 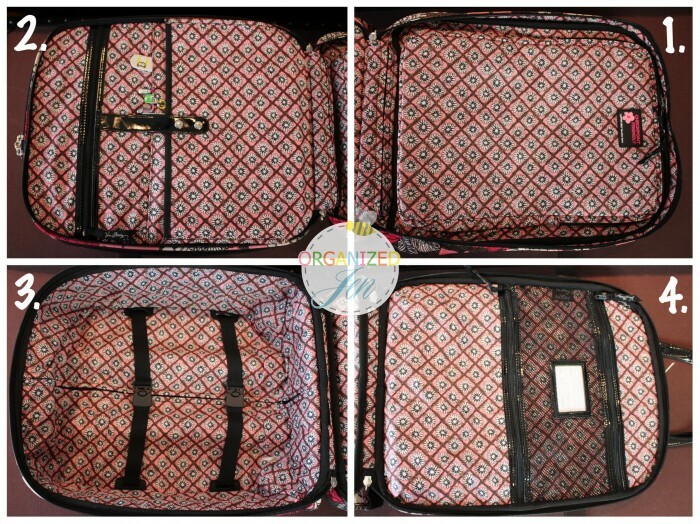 I was wondering if you could recommend another carry-on bag by Vera Bradley out currently that is most-comparable to the 17″ Roll Along Tote? I was looking for a bag with a different print than the one that is offered in this particular bag but don’t want to part with this bags travel-friendly qualities. Love you and your vlogs! You truly are an inspiration! As I’ve only ever personally used the 17″ Roll Along Tote, I can’t properly comment on the other VB rolling luggage available now. I can say that my 17″ tote is extremely well made and I love it!